Treatment and management of developmental disabilities can come in a variety of different forms. Merely Training a child according to class curriculum might do well to him in a particular standard but in the long run it is not a sublime remedy. The children are encouraged to express their thoughts in their language and improvement in their skills is done through indulging them in such tasks. Through this we build on the confidence of the children. One of the early signs of LD is delayed Speech Development. Also Speech is hampered in various disorders which fall under the spectrum of learning problems. In such cases the speech is helped and facilitated through Speech Therapy. A combined application of neuro sciences and bodily sensations to evoke adaptive responses. Sensory Integrative Therapy is found to be highly beneficial in younger children. Various SI modalities including the ambience and physical environment of the centre is precisely appropriate to facilitate learning as well as plan and organize behavior on part of child. Shristi Learning Center is involved in providing Sensory Integration. Sensory integration is necessary for almost every activity that we perform because the combination of multiple sensory inputs is essential for us to comprehend our surroundings. Sensory integration include the five classic senses of vision (sight), audition (hearing), tactile stimulation (touch), olfaction (smell), and gustation (taste). The reasons for a child’s under performance could be attributed to Biomechanical, Neural, and perceptual incompetence. Occupational Therapy can improve their cognitive, physical and motor skills as well as address psychological, social, and environmental factors that impact your child's functioning. 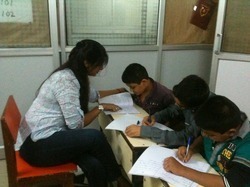 Shristi Learning Center is involved in providing remedial education. 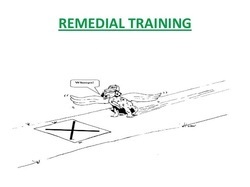 Remedial Training is defined as an instruction method which helps students to provide knowledge and skills necessary to succeed in their tasks and build their confidence. We follow an eclectic approach to solve the intricate issues through a comprehensive study involving the Neurological, Psychological & Sensory Processes. The way of teaching and the process of learning determine the extent of a learned behavior. Through special education the teaching behavior is modified in such a manner that learning is interesting and light to the child and thus the assimilation and retention in memory is better. Target group: Children with poor or weak vocabulary / poor comprehension or understanding of text. Looking for “Therapies & Management”?